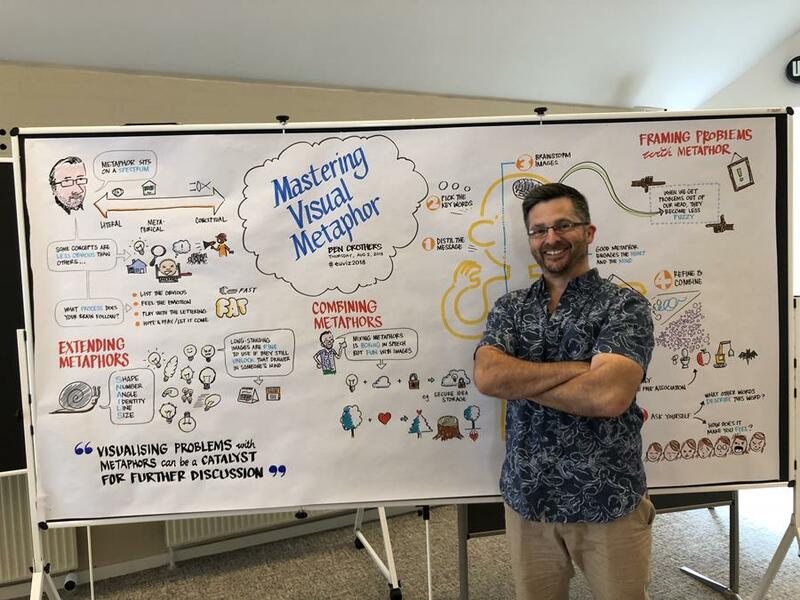 I'm feeling both energised and jet-lagged, fresh off the plane after attending the EUViz 2018 conference in Rungstedgaard, Denmark earlier this month. EUViz was the name of this year's annual global conference for visual practitioners, held in conjunction with the International Forum for Visual Practitioners. 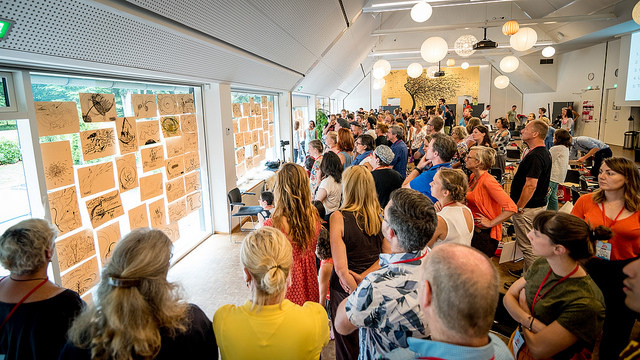 Around 200 graphic recorders, visual facilitators, illustrators, and visual thinkers descended upon Denmark from all over the world. The theme of the conference was to "energise the field, reflect, and embrace its full potential." I also took the opportunity to take a few days off and cycle around the island of Funen, west of Copenhagen—a delightful reprieve from the bitter Melbourne winter! The big announcement at the conference was that next year's conference will be held at Mont St Clair University, about 20 minutes out of New York City. If attending the IFVP conference has been on your radar, then piggybacking a holiday to the Big Apple might just be the incentive you need. Perhaps I'll see you there! Speaking of conferences, we're super excited to announce that we're organising one of our own! 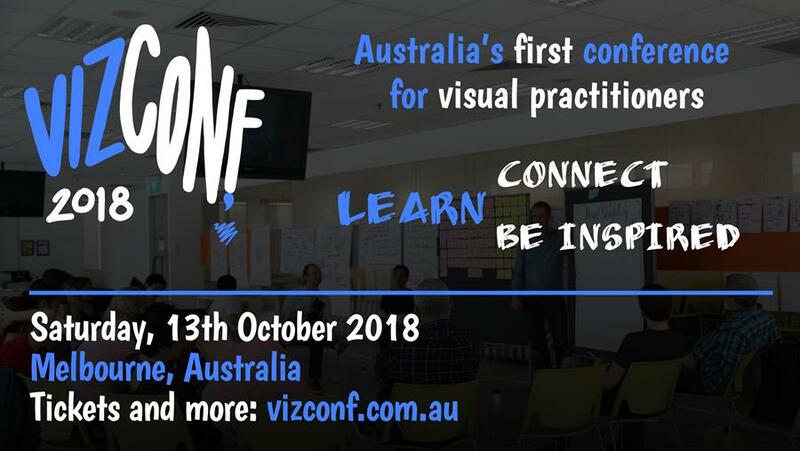 Yes, in partnership with the lovely folks at Visual Friends, VizConf 2018 will be held on Saturday, October 13, right here in Melbourne, Australia. 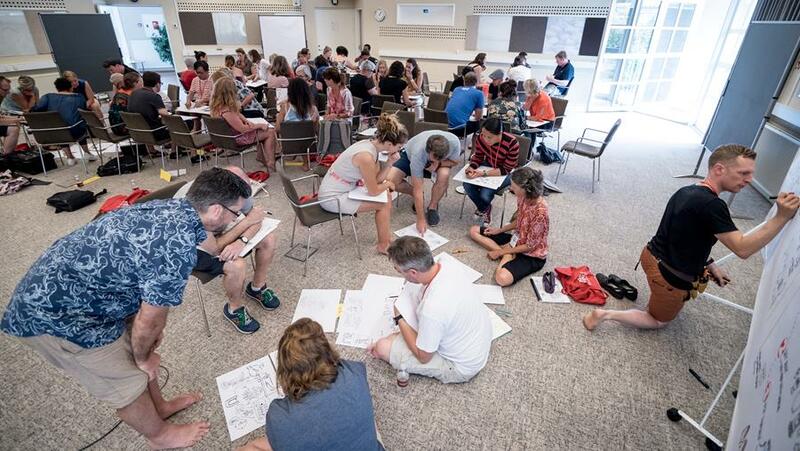 Australia's first conference for visual practitioners will provide a unique opportunity for graphic recorders, visual facilitators, illustrators, and other visual thinkers to come together to network, learn, and get inspired. And if you're interested in taking your learning to the next level, there are a handful of pre-conference workshops in the week leading up to the day. 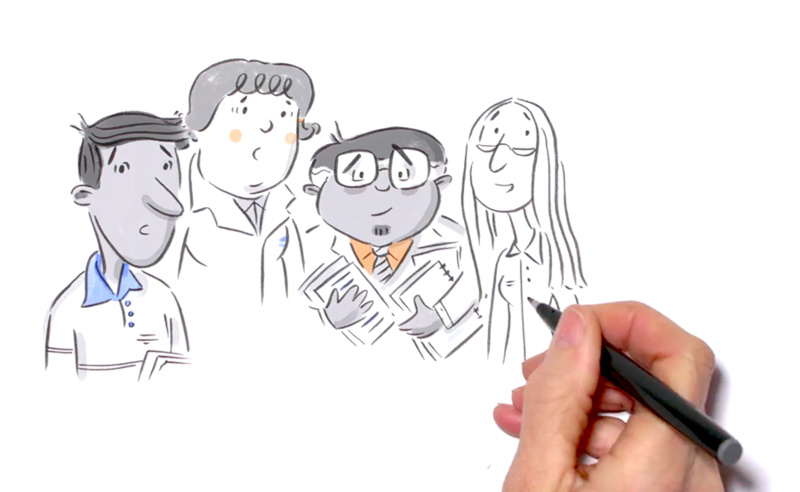 Sign up to learn more about graphic recording, visual storytelling, and more. To find out more, or secure your ticket, visit the conference website at vizconf.com.au. And please share this exciting news with anyone you think might be interested in coming along! 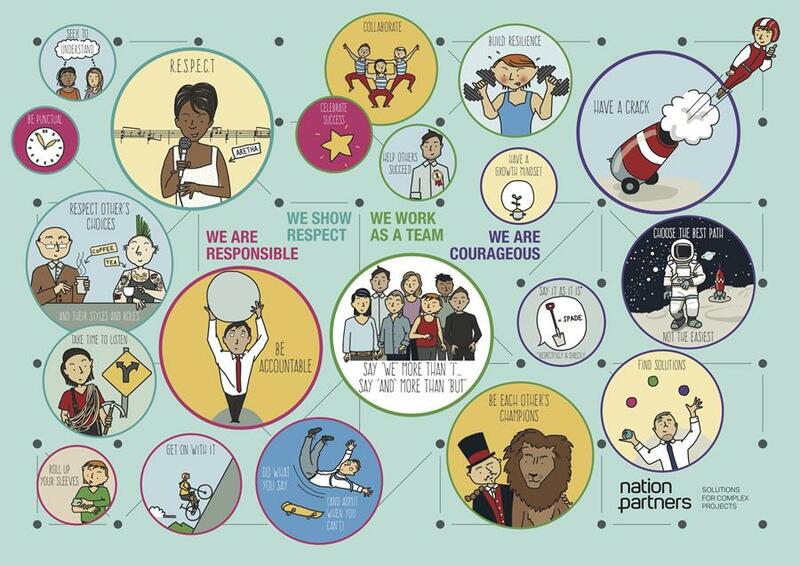 We recently worked on a sketch poster for the great team at Nation Partners. They wanted to showcase their agreed behaviours in a way that was visually exciting and embodied their sense of fun in an engaging and informative way. And we were very happy to help. We're really proud of the final product. It's lovely working with like-minded creative people to create images we're all thrilled with. 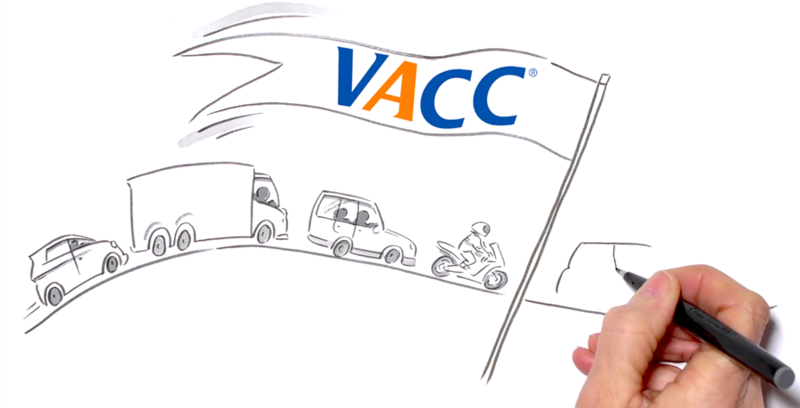 We love working with VACC to champion their committees and the work they do! They wanted a video to encourage new members to get involved in their managing committees, and we were only too happy to oblige. Drawing cars, encouraging diversity and having fun are some of the best things about what we do ... this was a dream job and we're looking forward to see where our characters go to next in this series. That's all this month. Don't forget to follow us on Twitter, Facebook, or Instagram, if you do the social media thing.